BACKGROUND AND PURPOSE: Thickening of the temporal bone in stroke-age patients may obviate sonographic evaluation of the circle of Willis in 20% to 30% of patients. We assessed the diagnostic efficacy of contrast-enhanced transcranial color-coded duplexsonography (TCCD) for noninvasive evaluation of the circle of Willis in stroke patients with limited bone windows. METHODS: Of 171 consecutive patients who presented with ischemic symptoms in the middle cerebral artery (MCA) territory, 49 patients (32 female, 17 male; age range, 70.5 ± 10.6 years) had no detectable colorflow signals from the circle of Willis by TCCD because of limited acoustic windows. These 49 patients received an IV injection of a sonographic contrast-enhancing agent, Levovist (Schering; Berlin, Germany), and were re-examined. Correlative imaging studies of the circle of Willis were obtained in 42 of 49 of these patients. RESULTS: In 38 of 49 patients, contrast-enhanced TCCD enabled full visualization of the circle of Willis bilaterally; in an additional five patients, contrast-enhanced TCCD revealed only the portion of the circle of Willis ipsilateral to the probe through one temporal bone. In six of these 43 patients, contrast-enhanced TCCD showed MCA stenosis and MCA occlusion in three; three of the six cases of MCA stenosis and all three cases of the MCA occlusion were found on the symptomatic side. In six of 49 patients, no colorflow signals were obtained after contrast enhancement. All contrast-enhanced TCCD findings were confirmed by CT angiography, transfemoral digital substraction angiogaphy, MR angiography, or a combination of all three correlative studies. Levovist produced no serious adverse events. CONCLUSION: In stroke-age patients with limited acoustic windows, contrast-enhancement with Levovist can markedly increase the sensitivity of TCCD and increase the detection of clinically relevant intracranial arterial disease. Transcranial color-coded duplexsonography (TCCD) is a diagnostic tool that potentially improves sonographic evaluation of the intracranial arteries by permitting direct visualization of the vessels sampled and precise correction of the angle of insonation–features that are not possible with conventional transcranial doppler sonography (TCD) (1). Thickening of the temporal bone in stroke-age patients, however, may obviate detection of the circle of Willis in 20% to 30% of subjects (2, 3). The capability of low-frequency (2-MHz) sonography to penetrate the temporal bone to permit sampling of flow dynamics in the large intracranial vessels is inversely proportional to skull thickness. The skull is thicker in older patients, in women, and in non-Caucasians (2, 3). Both TCD, which provides discrete samples of blood rheology, and TCCD, which provides a contour of the blood column from which the samples are taken, require a good temporal acoustic window to insonate the middle cerebral artery (MCA) and the circle of Willis. TCD and TCCD are potentially desirable tools for the assessment of acute and chronic MCA territory ischemia. Complete MCA occlusion can be found in up to 50% of patients examined within 8 hours of MCA territory stroke (4–6), and patients can benefit from early lysis of the clot that can occur spontaneously or secondarily to therapeutic interventions. Occlusion and secondary clot lysis should be rapidly and noninvasively demonstrable by sonography. In patients with acute hemispheric ischemic events, sonographic studies of intracranial hemodynamics, therefore, can be important, especially if thrombolysis is a treatment option. Similarly, in patients with subacute or chronic events, transcranial sonography typically should be able to reveal pathologic hemodynamics that help differentiate between embolic and low-flow ischemic injury. This information can be basic to formulating workup and management plans. Nonetheless, because stroke patients often are older, their acoustic bone windows may be limited or nonexistent, restricting the applicability of routine transcranial sonography. In recent years, sonographic contrast-enhancing agents have been used in an effort to overcome this problem. Levovist (Schering, Berlin, Germany), which consists of galactose-based microbubbles, is the most widely investigated agent and recently has been registered for the German market (7). EchoGen (Sonus Pharmaceuticals, Bothell, WA), a dodecafluoropentane emulsion, is a newer product that only more recently has been applied to the neurovascular system (8) but for which there is no published report for its intracranial applications. In this study, we evaluated the efficacy of Levovist for visualizing the circle of Willis by TCCD in patients with hemispheric ischemic symptoms in whom unenhanced TCCD did not provide colorflow signals of the intracranial arteries because of absent bone windows. Our investigation studied stenotic and occlusive lesions of the circle of Willis and was designed to provide prospective correlative imaging data obtained by CT angiography (CTA), MR angiography (MRA), or digital subtraction angiography (DSA). From January 1997 to April 1998, 171 patients were admitted to our neurology department for transient or permanent ischemic hemispheric symptoms. All patients had a complete sonographic evaluation of the carotid system as well as a TCD and a TCCD study. Our routine sonographic studies for the carotid system include performance of one indirect noninvasive test (periorbital directional Doppler sonography) and of three direct tests (colorflow imaging, duplex imaging [B-mode/pulsed-wave Doppler examinations] and continuous-wave Doppler sonography). When performing TCD, we followed the protocol of Aaslid et al (9). We selected for contrast-enhanced TCCD those patients in whom precontrast TCCD could not adequately reveal the arteries of the circle of Willis because of limited bone windows. The diagnosis of limited bone windows was made by two independent, experienced investigators (GG and SH). Forty-nine consecutive patients with limited bone windows (32 female, 17 male; age range, 70.5 ± 10.6 years) were enrolled in the study. The interval between onset of cerebral ischemia and contrast-enhanced TCCD ranged 7.7 ± 6.7 days. Contrast-enhanced TCCD was performed by one experienced person (GG). Beginning with an almost axial cut through the butterfly-shaped midbrain, we tried to detect the basal arteries of the circle of Willis by tilting the sonographic probe slightly upward. If no colorflow signal was found after this procedure, we proceeded to perform contrast-enhanced TCCD. In some patients, the midbrain was not visible in B-mode; in those patients, the echo-dense structures of the petrous bone were used for orientation (10). Sonographic examinations were performed with an ACUSON 128XP/4 (Acuson, Mountain View, CA) with a 2.0- to 2.5-MHz transcranial sector scanner device. Quantitative gain values are not available on the Acuson XP/4, but for each patient, the gain was adjusted during the contrast-enhanced sonographic study to optimize imaging data. The application of Levovist was limited to four vials containing 2.5 g of Levovist for cost effectiveness. First, the right side of the circle of Willis was evaluated through the right temporal bone after IV application (via the antecubital or peripheral arm vein) of 1.25 g of Levovist in a concentration of 300mg/cc as a bolus [corresponding to half a vial (4.5 cc) of Levovist]. If sufficient enhancement was observed, we used the second half of the vial to evaluate the patient through the left temporal bone for evaluation of the left side of the circle of Willis. If no or insufficient enhancement of the ipsilateral MCA was observed on the right side 2 minutes after application of half a vial of Levovist, the second half of the vial was injected, keeping the probe in place. If enhancement was still not detected, 2.5 g of Levovist, in a concentration of 400 mg/mL, was injected. If no enhancement was observed after these two injections, no further attempt was made on the right side. The same procedure was repeated on the left side. The examiner tried to identify all branches of the circle of Willis including 1) the entire M1, A1, and P1 segments of the MCA, the anterior cerebral artery (ACA), and the posterior cerebral artery (PCA), respectively; 2) the proximal M2 and P2 segments; and 3) the distal intracranial internal carotid artery (ICA). Colorflow signals were analyzed for flow direction and turbulence, which were further evaluated by duplex spectral waveform analysis. For diagnosis of intracranial arterial stenosis, we followed the suggestions of Hennerici et al (11). The duration of contrast enhancement was determined by measuring the interval from the first appearance of colorflow signals after injection of Levovist to the moment when diminishing colorflow signals did not permit further sonographic evaluation. A complete contrast-enhanced TCCD takes about 5 minutes; the diagnosis of insufficient bone windows can be made in a few seconds. The findings were detailed immediately after the sonographic examination in a self-developed chart. The examiner was blinded to the results of other vascular imaging studies. All contrast-enhanced TCCD studies were recorded on super VHS videotape. Correlative imaging studies were performed within 24 hours of contrast-enhanced TCCD. Thirty-four patients underwent correlative CTA; of these 34 patients, four also underwent correlative MRA, three underwent DSA, and one underwent all three studies. Six patients only underwent correlative MRA, and two only underwent correlative DSA. Seven did not undergo any correlative studies. Correlative studies were not performed in two of these patients because of a cardiac pacemaker combined either with a history of allergy against iodinated contrast agents or renal insufficiency. Five patients refused further studies or could not be evaluated within 24 hours of contrast-enhanced TCCD for logistical reasons. CTA, MRA and DSA were performed by neuroradiologists (JG, RvK) who were blinded to the results of the contrast-enhanced TCCD. Of the six DSA procedures performed, one was done for preoperative workup of carotid artery stenosis, two were done because of acute or evolving stroke, and one was done because of a suspected arteriovenous malformation. In 38 of 49 patients, contrast-enhanced TCCD provided complete visualization of the circle of Willis bilaterally (Fig 1A-B). The mean duration of contrast enhancement was 2:43 minutes with a range of 0:45 to 7:06 minutes (median, 2:28 min). The enhancement started after a mean time of 22 sec (range, 6–37 sec). 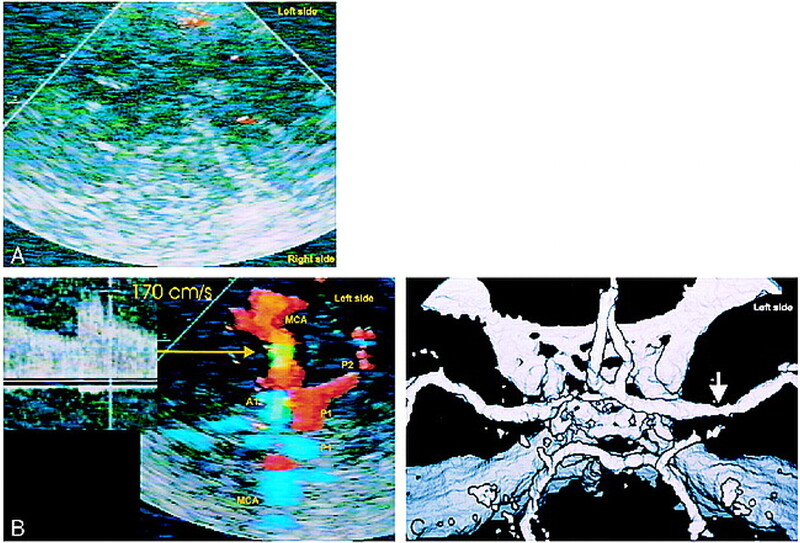 In six patients, contrast-enhanced TCCD revealed MCA stenosis (Fig 2A-B) and MCA occlusion in three patients (Fig 3A-B). CTA confirmed these findings (Fig 2C and 3C). Three of the six cases of MCA stenosis and all three cases of MCA occlusion occurred on the side of cerebral symptoms and were thought to be etiologically related to the patients´ recent ischemic events. Three cases of MCA stenosis were located on the asymptomatic side. In one of the latter, MR imaging revealed an old, established infarct distal to the MCA stenosis. In another patient, who presented with a fixed ischemic deficit referable to the right MCA territory but no evidence of MCA stenosis, contrast-enhanced TCCD depicted severe stenosis (systolic peak velocity 400 cm/s) in the left P1 segment of the PCA, and CT showed an old infarction in the left occipital lobe distal to this left PCA stenosis (as well as a new infarction in the right MCA territory). Based on CTA results found before contrast-enhanced TCCD was performed, this P1 stenosis was first misdiagnosed as a vessel aplasia. The contrast-enhanced TCCD findings and the brain CT evidence of associated occipital infarction were strong evidence that the lesion indeed represented a pathologic stenosis. A–C, TCCD without contrast enhancement (A) of a 57-year-old man provides no colorflow signals; contrast-enhanced TCCD (B) shows a mild left middle cerebral artery stenosis (arrow); Correlative CTA (C) confirms mild middle cerebral artery stenosis (arrow). 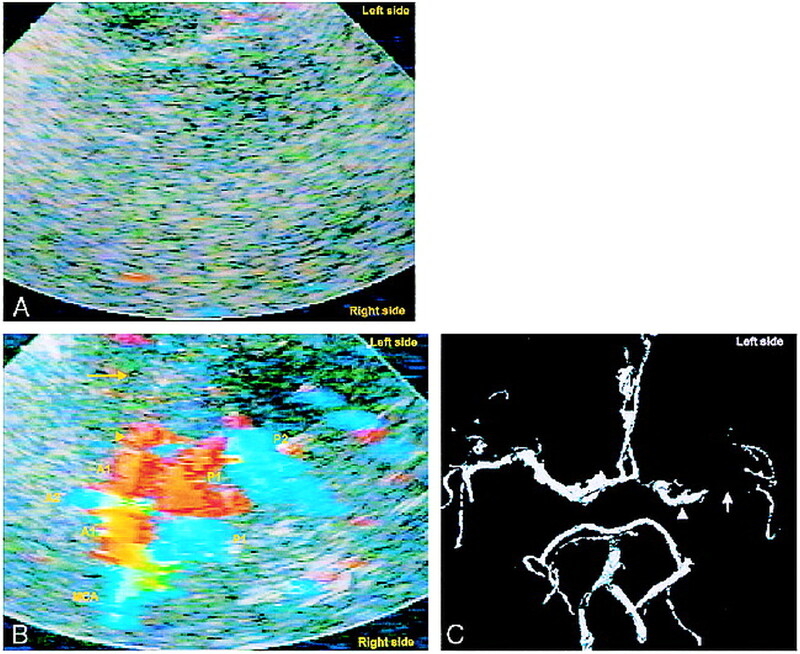 A and B, Unenhanced TCCD (A) of a 78-year-old woman provides no colorflow signals; contrast-enhanced TCCD (B) shows entire circle of Willis except for left MCA (yellow arrow), indicating MCA occlcusion. C, Correlative CTA confirms MCA occlusion (white arrow). Left A1 appears hypoplastic, yet contrast-enhanced TCCD makes both A1 segments appear similar in size, a possible blooming effect. Left M1 segment appears shorter on contrast-enhanced TCCD image than on CTA (arrowheads). Because 2 hours elapsed between the performance of contrast-enhanced TCCD and CTA, this may represent partial recanalization of the MCA. In three patients with unilateral severe symptomatic carotid disease, contrast-enhanced TCCD provided information about collateral flow. In two patients with a symptomatic critical stenosis at the origin of the left ICA (residual lumen diameter <0.7 mm, corresponding to a 90–95% stenosis), contrast-enhanced TCCD showed strongly retrograde flow in the left ACA, suggesting robust collateral cross-flow to the ipsilateral MCA, which would suggest that the MCA territory infarctions probably had an embolic rather than a low-flow etiology. In another patient with symptomatic ICA stenosis with a residual lumen diameter of <0.7 mm (90–95% stenosis), contrast-enhanced TCCD showed an antegrade ACA on the side of carotid stenosis and could not enable identification of a PCA. These findings characterize an isolated hemisphere, which puts a patient at high risk for low-flow stroke. Confirmatory DSA findings were found in this patient. In all other cases, CTA, DSA, or MRA also confirmed the findings. We used a total of 97 vials Levovist (mean, 1.98 vials/patient; 71 vials in a concentration of 300 mg/mL; 26 vials in a concentration of 400 mg/mL) (Table). In 20 (40.8%) of 49 patients, the short duration of contrast enhancement required additional doses of Levovist for bilateral evaluation of the circle of Willis (Table). In five patients, contrast-enhanced TCCD showed only the ipsilateral half of the circle of Willis through one temporal bone window; no detectable signals were obtained through the other temporal bone. In four of these five patients, the side of the insufficient acoustic temporal bone window was on the symptomatic side. In six patients, no reasonable signal was detectable though either temporal bone. In these patients, we did not find improvement of colorflow signals when using 400 mg/mL instead of 300 mg/mL of Levovist. No serious adverse events occurred after application of Levovist, but four patients reported a generalized sensation of heat. We studied the efficacy of Levovist for the TCCD examination of 49 patients with hemispheric transient ischemic attacks and stroke in whom no temporal acoustic window could be found on an precontrast TCCD study. Contrast-enhanced TCCD revealed the circle of Willis on the symptomatic side in 43 (88%) of 49 subjects. Ten cases of intracranial stenosis or occlusion were found with contrast-enhanced TCCD, six of which were related to recent or remote ischemic events. Three cases of MCA stenosis were contralateral to the presenting symptoms, as was one PCA stenosis, which by CT was shown to be associated with an old occipital lobe infarction. Additionally, in three cases of carotid stenosis without MCA obstruction, contrast-enhanced TCCD showed physiologic changes consistent with a carotid embolic or low-flow etiology of the clinical ischemic events. Correlative imaging supported the contrast-enhanced TCCD findings in 42 of 49 cases. Of the 171 original patients from whom the 49 were drawn for lack of acoustic windows, the selective use of contrast-enhanced TCCD increased the rate of sonographic detection of clinically relevant vessels from 71.3% to 93.6%. This study demonstrates the effectiveness of Levovist enhancement for facilitating detection of clinically relevant information. Four other investigations have reported on the use of Levovist for TCCD evaluation of the intracranial circulation in patients with recent hemispheric ischemic events and limited bone windows (12–15), two of which had similar designs to ours. Postert et al (12) and Goertler et al (13) included, as in our study, patients whose mean age was over 65 years, who had no intracranial flow detectable on the unenhanced studies, and from whom correlative clinical data were obtained. They looked at patients with acute (<12 hours), established strokes. Postert et al also provided correlative imaging data. Of 20 patients in the former study (Postert), and 16 in the latter (Goertler), contrast-enhanced TCCD enabled good MCA visualization on the symtomatic side in 100% and 81%, respectively. With contrast-enhanced TCCD, the former study harvested 11 cases of MCA occlusion (55% of patients) (12) and the latter identified four cases of MCA stenosis and three cases of MCA occlusion (44% of patients) (13). The lower percentage of cases of MCA stenosis and occlusion detected by contrast-enhanced sonography in our study (16% total) may be owing to the fact that our patients were examined subacutely, and clot lysis may already have occurred. Postert et al and Goertler et al focused their study on the symptomatic hemisphere and did not report abnormalities of the asymptomatic hemisphere. We attempted to evaluate both hemispheres by using up to four sets of microbubble injection. Two potential drawbacks of the contrast enhancement are the “blooming effect,” which occurs shortly after injection because of the high concentration of the enhancing agent in the circulation, and the short half-life of clinically useful contrast-enhancing agent (2:43 min with Levovist, 8:40 min with EchoGen). The former causes echoes from moving blood to spill over vessel wall margins, creating exaggerated depictions of the vascular pathways. Although the blooming effect degrades anatomic resolution, it does exaggerate the size of the vessel, so that some vessels or lesions become more obvious. This happened in our study with the identification of a PCA stenosis (contralateral to the side of hemispheric symptoms) that on an initial CT angiogram was read as an atretic vessel. The focal high Doppler velocity (400cm/s) in this vessel and an associated occipital lobe infarction caused the original CTA report to be amended. Because of the short half-life of clinically useful sonographic contrast-enhancing agents, the examiner often needs to focus her/his attention on the arterial system and vessel of interest, especially if both Doppler and colorflow signals are to be recorded. Nevertheless, in our study, we were able to detect four lesions contralateral to the vessel of interest; two were relevant to prior ischemic events. Because contrast-enhanced TCCD can be done safely, quickly, by the bedside, and in poorly cooperative patients, contrast-enhanced TCCD performed without a baseline unenhanced study might be advisable in uncooperative patients as well as in hyperacute stroke patients when they arrive in the emergency room and are candidates for thrombolysis. In these situations, the blooming effect is particularly useful, because if all vessels have exaggerated profiles, the vascular topography is rapidly evident. In cases of suspected MCA stem embolus, if all the vessels off the circle of Willis can be accounted for except for the MCA, the findings are essentially pathognomonic of MCA occlcusion (Fig 3B-C). A complete contrast-enhanced TCCD takes about 5 minutes. Whether one does a subsequent CTA, MRA, or DSA depends on the time elapsed after ictus, the clinical circumstances of the patient, the resources of the facility, and the experience of staff. Our study provides additional evidence that, in selected cases, contrast-enhanced TCCD can reveal clinically relevant lesions, and represents an important contribution to the noninvasive evaluation of the intracranial vessels in recent stroke patients. ↵1 Address reprint requests to Georg Gahn, MD, Department of Neurology, University of Technology, Fetscher Str. 74, D-01307 Dresden, Germany. 2 This work has been supported by Schering of Berlin, Germany.